Got a Samsung Gear S3 for Christmas last year. Paired it with my V20. Worked fine for a few months. Then it stopped pairing successfully. I had to factory reset the watch anytime I wanted it paired. The times it did pair without factory reset, the gear software wouldn't recognize it but the phone would......sometimes. Finally got a hold of Samsung. After them not being able to find the device with the serial number at first, they finally found it. Then told me that the watch is not compatible with the V20. I don't want the watch if it won't pair and give me ALL the features. So now I need to sell it off. Smh. I'm not going to get the full value to purchase another smart watch that is compatible. So, mine didn't either for the first few months then became completely unreliable and disconnected. Well you are correct, it is not listed as a compatible watch only the V10. The Galaxy watch however is compatible with the V20. Bwajaja, what a numerous response. That is exactly what I would have said in the months it was working. However after my watch and phone stopped syncing up regularly and I finally decided to contact Samsung about it. Again, my friend, I was in your exact position. Take it back now if you still can and find one that is compatible. I'm trying to sell mine off to get another one. My GearFit2 works fine on my V20. Samsung made their watches compatible on all phones now, before it was exclusive to Samsung only. Maybe factory reset your phone? Did you update it to Oreo? Factory reset the watch too. 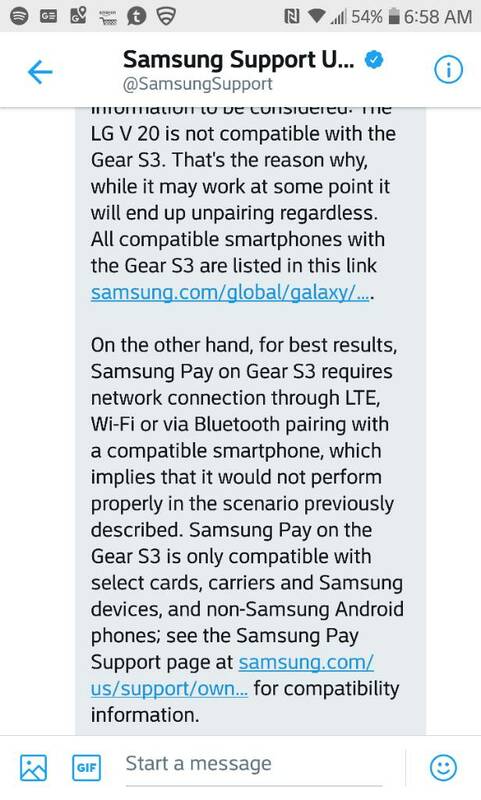 I'm sure it is compatible unless there was an update on the Gear S3 that changed that. Did you read my response above and look at their website? It is not compatible. 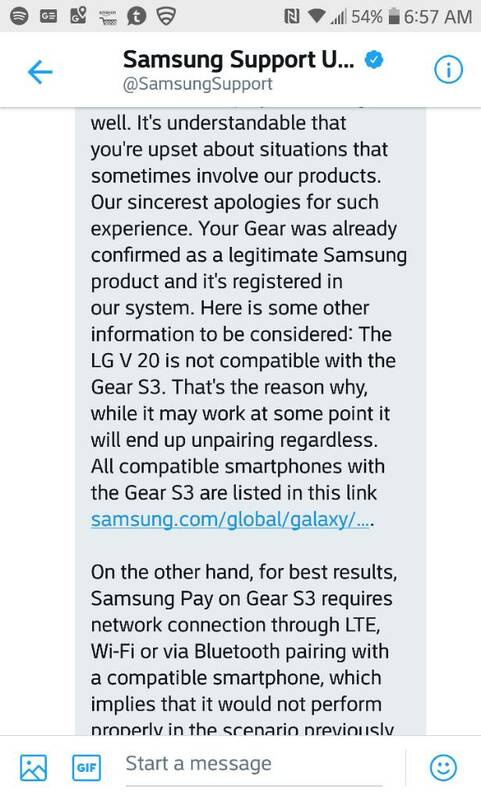 Regardless of what we say or experience, Samsung has stated it is not compatible. This didn't mean it would not work but if it did stop working, then they're not responsible because they didn't make it compatible. I say great to you and others. How long has yours been working with your V20? I think I got at least three solid months before it stopped working regularly. Then I waited longer before I got in contact with Samsung.